The dress is part of the Sposa 2016 collection by London designer David Fielden. It is made of luxurious satin with a lace and organza flower detail back. 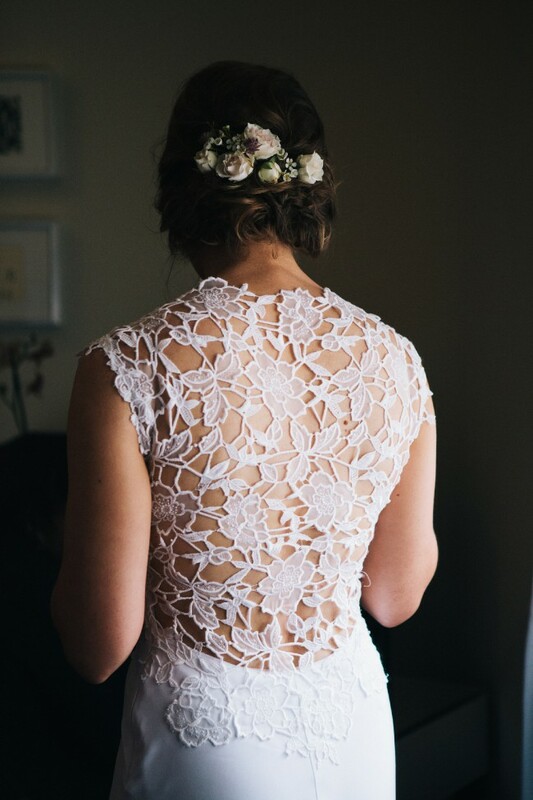 I have tried on numerous dresses, but this one combined a beautiful neckline with a back design that I have not seen on any other dress before. Even after the wedding, I am still getting compliments. The fabric flows really nicely and the dress is incredibly comfortable, never once did I feel restricted by it or hot during our summer wedding. It has been made to measure in the designer’s flagship store in London. I have been a skinny UK size 12 at the time of the wedding. So the dress would suit a skinny UK size 12 or a size 10. The dress is floor length, I am 1.72m and wore 75mm heels. Bra cups have been sown in. I’m size 34C, but these can be changed very easily by a seamstress. The dress has been professionally dry cleaned in Chelsea on recommendation from the designer. It is in pristine condition without any stains and just showing the expected signs of use at the bottom of the train which could be shortened. Dress comes in original garment sleeve from David Fielden. Please feel free to contact me to arrange a time to view the dress or if you have any questions/ would like to see further images. Open to offers. Once you send a message, Melanie can invite you to purchase the dress.